Yesterday I got a comment on another post from a parent who ended up on my blog. The short version is that at a public play-place her son was hurt by a child with DS and she didn't know what to do about it, because how can you blame a child with DS for anything? I offer the comment in full and then my response. I need advice. I have a four-year-old son who does not have Down Syndrome. Today, we went to a restaurant that had a play area. My son is big (tall and muscular) for his age, and I've always been worried about his playing in the play area there in fear that HE might hurt someone. Today at lunch he came screaming and crying out of the play area. It took five minutes to calm him down to the point to figure out that another child hurt him. At this time, I saw a mother enter the play area and then come back out (by herself) but look at me as if I were a horrible parent because my child is screaming in the restaurant. So, after I finally calm my son down enough to find out that another child pinched him on the cheeks hard (and also I later found out from another child that the same child had first hit my son on the chin...and on the way home discovered that the child had pulled my son's legs out from under him), I decided to go find the child, explain to him (possibly not in the nicest tone of voice) that hurting my child is not acceptable, and then tracking down the child's parents (by the way...the woman who stared my child and me down for my son's screaming was the boy's mother and she knew what he did and still did nothing to stop the child) to explain to them that their child's behavior was unacceptable...it turns out the child had Down's. The one who violently hurt my son. Of course, I couldn't take action against the child or the parents, but how do you explain to a four-year-old who only understands that he was hurt for no reason? (By the way, my son did not behave with aggression to the child. Several other children and the parents who were sitting in the play area--the only reason I was not in there physically was because there was no more room for parents--substantiated that the other child turned violent toward my son for no reason.) How is anyone (whether they "know" what they are doing or not...and this child knew that what he did to my child was wrong) allowed to do violence to another? How is it more acceptable for some? Because I even knew it was "taboo" to blame a child with Down's for his behavior. I hate to say it, but I'm furious with the parents because they knew that their child was violent, knew that he was the one who hurt my son, didn't remove their child from the play area, didn't apologize to my son (but instead looked at me as if I were a horrible mother and my child a horrible child because my child was screaming because THEIR CHILD HURT MY CHILD). DEAR READERS PLEASE NOTE - The person with the comment and I have exchanged emails and I anticipate she will read this blog. If you are rude in comments, I will simply delete your post without warning! It's fine to disagree thoughtfully, I'd love to hear better ways of framing a response, but no rudeness to someone genuinely looking for help. I'm really glad you wrote me and want to have this conversation. It's important. When my son was three, the idea that he could just go into a play area and be around the other kids as seemed impossible. How could he control his behavior? What if the other kids didn't understand his limitations? Most of all, what if he got stuck in one of the big climbing contraptions? Could he even physically, ever, go up those ladders and down those slides? Now he does it all the time. I'm so proud of his physical and social development, but I'm still always worried something will go wrong. So far mostly so good, but your story reminds me of the challenges. First - Having Down syndrome does NOT mean one can hurt other people without consequence. That is exactly the opposite of the message that I would hope to convey. I actually think it's extra vital that we make sure that our children understand the consequences of their actions. It's a harsh world out there for people with disabilities, and learning control is vital to inclusion. The problem is how. How do you make the connections between actions and results apparent with someone who has speech/developmental delays? There are solutions, or at least ideas, and I'll offer them below. Second - I was struck by how often you talked about feeling shame. Other parents were looking at you, you felt like a bad mother, but you know that you didn't do anything wrong. It's not a good feeling. Here's something to consider - That shame you were feeling, the shame that the other parents are looking at you and blaming you, parents of kids with disabilities live with that shame all the time. It can get really oppressive, making parents like us self-isolate. We just stay home, keeping our kids out of the grocery store, playground, or even school. I've felt it, I feel it all the time when my son acts in a non-typical way, or his nose is too runny and people are judging me, when he shouts in the barber shop, when he dances randomly in the mall, I encounter so many micro-aggressions on a day-to-day basis that you'd think I'd be used to it, but no. I still feel shame. So I'm asking you, as a parent, to think about that emotion you felt, to know that you were in the right here, but to approach those parents with compassion and empathy. So now what? I operate under the principle of inclusion, but not same-ness. My goal is to have your son and the boy with DS included together, safely, in the play-space. That doesn't mean consequence-free violence, but it also doesn't mean that you can respond to the incident as you would for other kids, because the usual methods of parental reaction - yelling (sadly), time-outs, removal of privileges - might not have any meaning. Yeah, a parent can take away a toy or fun activity from a four-year-old with Down syndrome, but depending on their developmental level, it might not have any meaning. How do you connect the consequence to the act of hurting your son? That's the challenge here. The first step is to understand what might have happened. What does the violent behavior - pinching, tripping, hitting - mean in this case? Does it come from anger? Aggression? Confusion? Fear? Sometimes it's from over-stimulation. Or, and this is pretty common, people with Down syndrome use physical responses as an alternate form of communication. When you don't have words, hitting or hugging communicates perfectly well from the perspective of the child, and it might not even communicate what you think it does. People with Down syndrome are not any more likely to be violent by nature than anyone else, in fact probably less so, but they do often have boundary issues. Maybe the parents knew their child was violent, as you say, but maybe not. We - parents - are often surprised by our children's response to situations. I knew a boy who liked to grab hair and pull - it was an interesting texture and sensation for him. My son often pushes hands away, sometimes slapping, when he's angry or frustrated. One time my son Nico was so afraid of splashing water that he reached out and grabbed my face with his hand, cutting the skin with his nail, terrified. That's violent, but different than fighting from aggression or anger, or from knocking someone down because you're playing ninja and don't have good control. The goal here is to communicate. We don't want four year olds, or fourteen year olds, hitting as a way of expressing their frustrations. On the other hand, typical interventions - yelling, time outs, taking away privileges - might not have a lot of meaning for the child with Down syndrome. When my daughter misbehaves, we talk about it, we make sure to verbalize a clear cause-effect relationship. When my son, who has DS, misbehaves, we have to be more creative. There are intervention strategies for kids with Down syndrome who are "challenging." You focus on skills. You focus on communication. You find positive reinforcement rather than punishment (which works better for all kids). 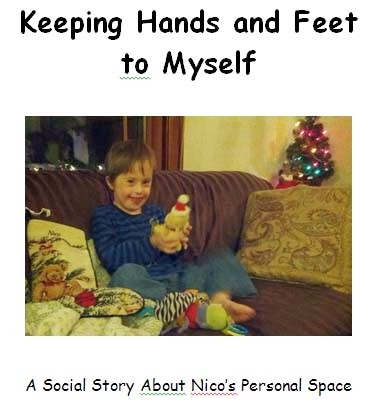 One technique we've used with Nico is the social story. They are picture and word-based behavioral stories that try to make sure a person understands a situation and the consequences of actions, to help them make better decisions in the future. They use a lot of positive affirmation and perhaps one or two pieces of instructional advice to try and achieve better response to situations. Therapists make them for their patients, though parents can make them as well. Here, for example, is a story about playing nicely with a brother, easily adapted for a public playground. Here's another. Social stories have worked wonders for my son, but each kid is different. Comfort your son and comfort yourself! I'm sorry that people looked at you as if you were a horrible parent, but don't let them get you down! People judge all the time and are usually clueless about context; ultimately, the opinions of strangers aren't that important (to me anyway). Remember that no outsider ever has a clue about what's going on in a family and try to just do what's right. If you see these parents again, I can't tell you they'll be happy to hear from you, but I think you have the right to talk to them because your son was hurt. Moreover, I think building an inclusive society requires someone to make the first conversational move, to reach out, and I'm hoping you are the one to do it. I would say something like, "I know you've got a lot of challenges, but I felt it was important to tell you that that your child hurt my child today in the play area. Is there a way we can talk to him about more appropriate play? Is there anything that I or my son can do to help?" In the end, I'm really sorry that your son got hurt. I hope, though, that this is a moment that can lead towards a more inclusive society, not away from it. Inclusion, not same-ness. We don't respond to this boy hurting your son the same way that we might from another child. Same-ness just won't accomplish anything. But we DO respond. We must respond, and respond with dialogue, patience, creativity, and empathy.